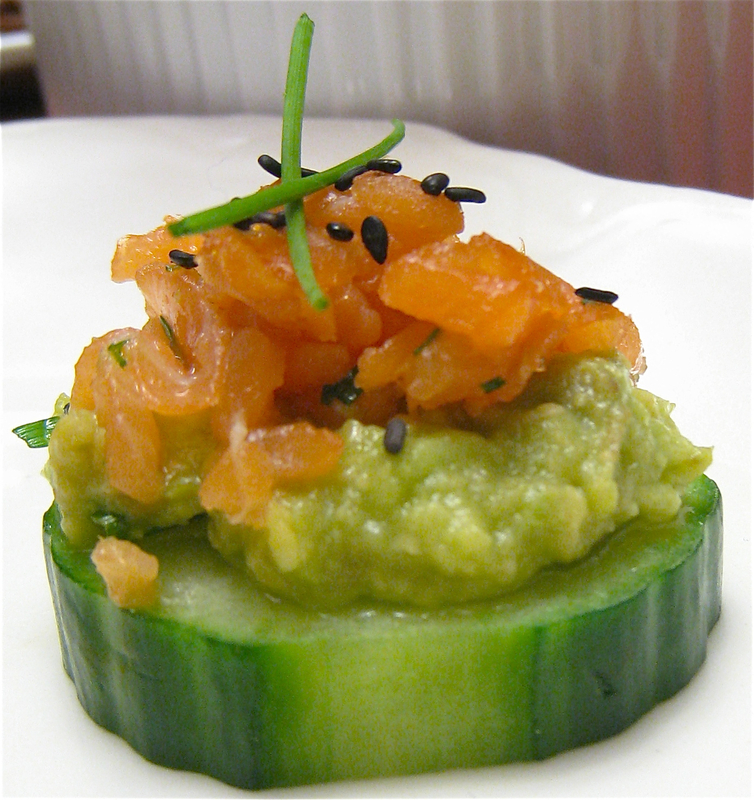 Smoked Salmon Tartare on Cucumber Slices | ohcrumb! The one and only piece I was able to snap a precious picture of. I love everything about Thanksgiving – its spirit, the food, the gathering of friends and family. I love the feeling of our modestly-sized home brimming with friendship, warmth, good cheer and healthy appetites. …And with healthy appetites comes the fun of planning a menu! In recent years, I’ve come to realize that I’ve grown up with a sort of unusual experience with food. Cantonese cooking and flavors were naturally a huge part of my food experience growing up because my parents immigrated from Hong Kong, and it is probably the cuisine from which most of my comfort food comes or resembles (Aside from things containing cheese. I love cheese). However, because my mom is naturally a curious person who embraces new things AND loves to cook, we also grew up with things like Italian nights, taco nights, kielbasa (which my mom called “the polish sausage”), borsch (“Russian soup”), and corned beef and cabbage. Note: I thought everyone ate corned beef and cabbage on St. Patrick’s Day, until I got to college. I feel like this is up there with thinking latkes at school during Hanukkah was a universal thing. Or almost up there with how I truly thought I was a descendent of the Pilgrims up until around high school, when it suddenly dawned on me that the Pilgrims were white and British, and I was neither. Talk about earth-shattering realization. Anyway, with this cultural confusion and mishmash of a culinary background, it’s only natural that Thanksgiving fare at our home is a just-as-mishmashed mix of traditional and non-traditional fare. Traditional things we always have are: turkey, potatoes, gravy, cranberry sauce, sweet potatoes and/or yams, stuffing, green beans, and pies of the apple, sweet potato or pumpkin variety. I should add that aside from the Turkey, gravy, and cranberry sauce, we almost never make any of the above the same way more than twice. A non-traditional Thanksgiving dish containing that ingredient is game as well. Non-traditional dishes have included Chinese-style pork ribs, char-siu (catonese-style roasted pork), chinese-style braised beef, lasagna, quiche, and cheesecake…basically anything easily made in large batches that will help fill the stomachs of the masses. Oh, and because food preparations are usually running late the day of, it’s only polite to provide appetizers as people mingle and wait. 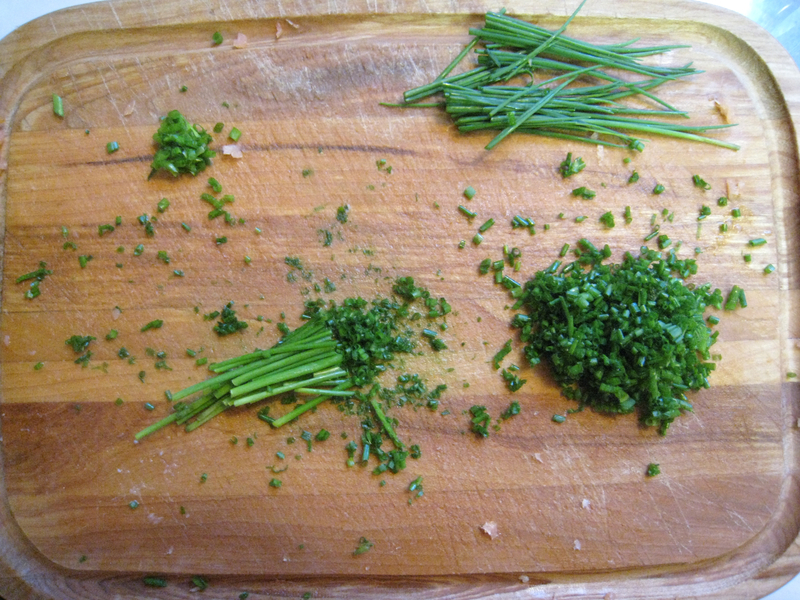 Clockwise from the top right: 1) Chives stalks for garnishing; 2) Somewhat finely but unevenly chopped chives for mixing with salmon; 3) Chives in the process of being finely but unevenly chopped; and 4) Little pile of chive remnants that are too big to be considered finely chopped, but which my knife skills are not good enough to further chop more finely. Ignore the little salmon bits on the board. Yep. The chives got me. Wait, this one does not have mayo on it. Maybe there was more than one piece left when I took pictures. Oh, and please do a better job than I did of spreading the avocado and salmon evenly and nicely. I hope to make this again some time soon. * Most incredible sandwich creation: Smoked salmon avocado BLT with Sriracha mayo – A Flour Bakery special that I stumbled upon one late dinner after lab that my watchful eyes have yet to see again on the specials board after 2 years. 1. In a bowl, combine the smoked salmon, soy sauce and lemon juice. Let stand for a minute. 2. Add the lemon zest, and mix. 3. Add the sesame oil and chives, and mix. Adjust ingredients to taste. Combine the mayo with Sriracha, to taste. 1. Spread a small amount of the mashed avocado on each cucumber slice to cover it. Top the avocado with the salmon tartare (I found it easier to use my hands than to spoon it). 2. Sprinkle salmon with black sesame seeds. 3. Top salmon with a squiggle of sriracha mayo (I used a frosting dispenser with the smallest round tip I could find). 4. Garnish with chive stalks. The ingredients and method are the same as above, but leave out the soy sauce and sesame oil. You might want a little more lemon zest. Or not. 1. In a small bowl, combine the chopped salmon, lemon zest and chives. Adjust to taste. 2. Assemble and garnish the same as above.